Blue Origin, the rocket company founded by Amazon’s Jeff Bezos, is about to undertake the 10th launch of its New Shepard launch vehicle, with its capsule chock full of experiments. The launch, which was originally scheduled for a month ago but delayed for various reasons, will take place tomorrow at 6:50 AM Pacific time. 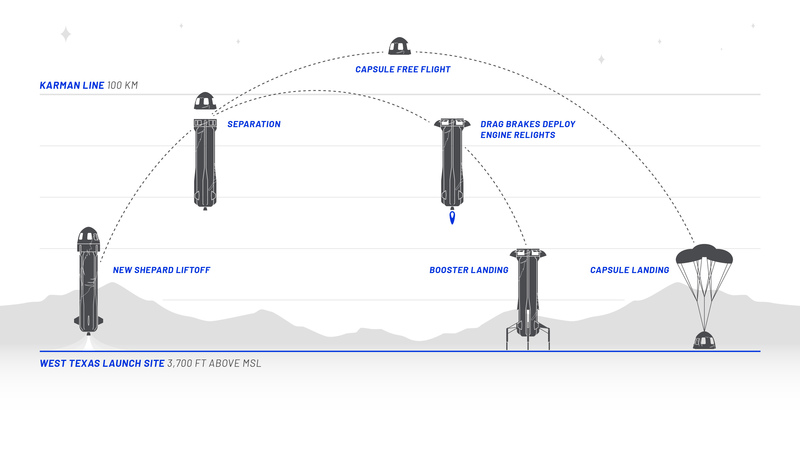 New Shepard is a sub-orbital space-visiting platform, not a satellite-launching one. But it uses a very traditional method of getting to the edge of space compared with Virgin Galactic’s rather involved mothership-spaceship combo, which scraped the very edge of space in its fourth test launch last month. The rocket shoots straight up, as rockets do, reaches escape velocity, then pops its capsule off the top just before the Karman line that officially, if somewhat arbitrarily, delineates space from Earth’s atmosphere. The capsule, after exhausting its upward momentum, gently floats back to the surface under a parachute. That’s the plan for Wednesday’s launch, which you can watch live here starting half an hour or so before T-0. But instead of taking a dummy load or “Mannequin Skywalker,” as the company calls its human stand-in during tests of the crew capsule, mission 10 has a whole collection of experiments on board. There are nine experiments total, all flying through NASA’s Flight Opportunities program. They’re detailed here. Most have already been up in other vehicles or even a Blue Origin one, but obviously repetition and iteration is important to their development. “The opportunity to re-fly our payload is helping us not only validate and compare data for different flight profiles, but also test modifications and upgrades,” said NASA’s Kathryn Hurlbert, who heads up the Suborbital Flight Experiment Monitor-2 project at Johnson Space Center. More Flight Opportunities spots will be available on future NASA-sponsored launches, so if your lab has an experiment it would like to test on a sub-orbital rocket, get at the administrators as soon as the shutdown ends. Update: Launch and touchdown successful! You can watch a replay here.